KATHMANDU, SEP 08 – Altogether 993 former Maoist combatants have filled up forms for integration in the seven main cantonments by Saturday. The selection process began on Thursday. Many of the 3,123 ex-fighters, who were initially waiting for integration, have complained that the age criteria set by the Special Committee forced them to change their priority. The Special Committee has said only those combatants who were born before May 24, 1988 are eligible to opt for integration. PLA soldier being discharged from a UN-supervised camp and offered "rehabilitation"
Kathmandu: Unified CPN-Maoist revealed on Thursday that the party had proposed to the Special Committee for Supervision, Integration and Rehabilitation of the Maoist combatants to integrate half of the total number of combatants living in the cantonments into different security forces. Politburo member and deputy commander of the People’s Liberation Army (PLA) Janardan Sharma said his party had proposed to integrate only half of the UNMIN-verified combatants and rehabilitate the remaining. He was addressing an interaction. While UCPN(M) Vice-Chairman Mohan Baidya and other leaders and rank-and-file members have opposed integrating PLA soldiers into the former royalist Nepal Army, Party Chairman Prachanda has been a vocal advocate of the integration plan. Now the UCPN(Maoist) has announced that it will send 10,000 of the 19,000 PLA members to join the 96,000 member US and Indian-backed Nepal Army and other security forces. This is the same Nepal Army that committed tens of thousands of atrocities against civilians in a futile attempt to stop the advance of the revolutionary people’s war from 1996 to 2006. Kathmandu – The Nepalese Army told the government not to extend the term of the UN Mission in Nepal (UNMIN), the first time the army has taken an official position over the political mission’s mandate, local media reported Saturday. 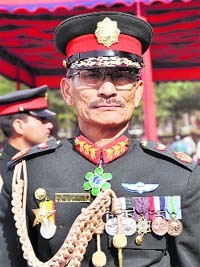 Army chief Chatraman Singh Gurung met Peace and Reconstruction Minister Rakam Chemjong late Friday to convey the army’s stand on the mission, which was created to support the peace process after the government and Maoist rebels signed a peace agreement in 2006, The Kathmandu Post said. [This interview with Prachanda in the June 2010 Red Star continues to promote the illusion that the Nepal Army can be “democratized” by a new Maoist-led government. 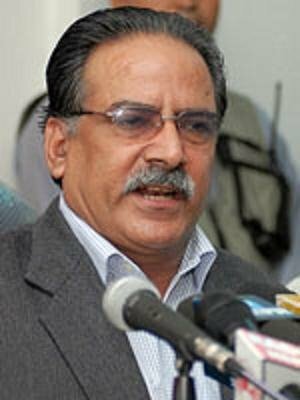 He says the party leadership will press to include the People’s Liberation Army as a “separate force” in the army, when in fact he has been engaged in intensive negotiations with the reactionary Nepali Congress and UML parties to integrate 3000-5000 PLA members (out of 19,000) into the army. He reaffirms that the party is not restoring the people’s governments in the countryside, and states that the main task is to take the peace process to the end. This is in direct opposition to the need to re-establish the people’s war and re-launch the new democratic revolution in Nepal-ed.]. The Politburo meeting that was held for the long time has decided that it will lead the national united government. If it’s sure that the national united government will be formed, who will be the prime minister? The politburo meeting has decided that national unity government must be formed under the leadership of UCPN (M). When the time comes to form that government our part will finalise about the leadership. We didn’t discuss it this time. The main focus is that the government must be formed under the leadership of our party. It’s the party that counts not the person. Your party has been demanding the formation of national united government. There are talks of majority government too. Are both the options open? Biplap on the Revolution in Nepal: Can We Go Ahead? 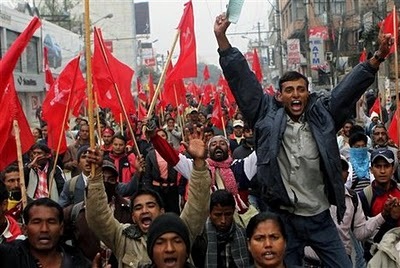 [This is an important article by Biplap, a member of the Secretariat and Political Bureau of the UCPN(Maoist), and is most likely a disguised polemic against rightist forces in the party. He stresses the issue of the internal and international situations for the advance of the revolution–though he underestimates the danger of an Indian economic blockade and military intervention in the event of a Maoist victory or major Maoist advances through re-establishing the People’s War. The debate in Nepal is on whether revolution is possible or not. The debate is not only ideological and general assumption; rather, it is centered on the question whether there is possibility to increase intervention in the central power state or not. Two sharp analyses have emerged on the issue. They are for and against. One of the analytical perspectives is that the revolt is impossible. Yes, it seems so from that side of perspective. This analysis has emerged mainly from the side of some leftist intellectual politicians and analysts. They have given the following reasons to justify this logic.